Socialist countries are quite adept at providing excuses for their inevitable failure. As socialist Venezuela hits bottom, the latest culprit is oil. Let’s blame failing oil prices for all the misery. But once prosperous Venezuela has one of the world’s most abundant oil reserves. Ninety-five percent of Venezuela’s income is from oil sales.The country should be swimming in riches. Instead, its people are starving, scavenging desperately for food. The government has helpfully suggested that eating beloved pets might help the hunger problem. Venezuela is in crisis. Many news sites point at falling oil prices as the reason. But oil prices have been rising since the fourth quarter of 2017, and Venezuela’s economy has only gotten worse. These higher prices should be a boom for Venezuela by creating greater revenues. Instead, its oil industry is in shambles and decline. Thanks to Venezuela’s mismanagement of its major industries, massive debts and defaults on payments are at an all-time high. Halliburton has written off its $312 million investment in Venezuela, as have other companies. With inflation an annual inflation rate of 16,428%, and its oil output declining by 12 percent in just two months, Venezuela is plummeting into an unprecedented disaster of its own making. - An annual inflation rate of 16,428%. "Venezuela’s death spiral continues to spin"
Falling oil prices are not the cause of Venezuela’s misery. It’s socialism. It’s the system whereby government owns the means of production. Historically, governments do a horrible job managing businesses. The Venezuelan government isn’t managing its industries on any level. It’s slowly destroying them. President Maduro has been unable to keep the oil industry running. There are no new investors because the government will confiscate any further exploration. For any economy to thrive, production must meet consumer demand. The available goods must be affordable to potential buyers. Venezuelans need approximately $150 per month to purchase a dozen of eggs.The averagemonthly income is $2.20, with a tiny stipend of government welfare. Citizens cannot afford to buy what is needed to live comfortably and healthy. That’s socialism. No centrally-run government has ever been able to create and produce efficiently. Many of Venezuela’s shortages have been created by price controls – another popular socialist tactic. When the government determines prices instead of market forces, prices become artificially low. This creates a greater demand for the product than the seller can deliver at any kind of a profit. The seller is losing money with each sale. 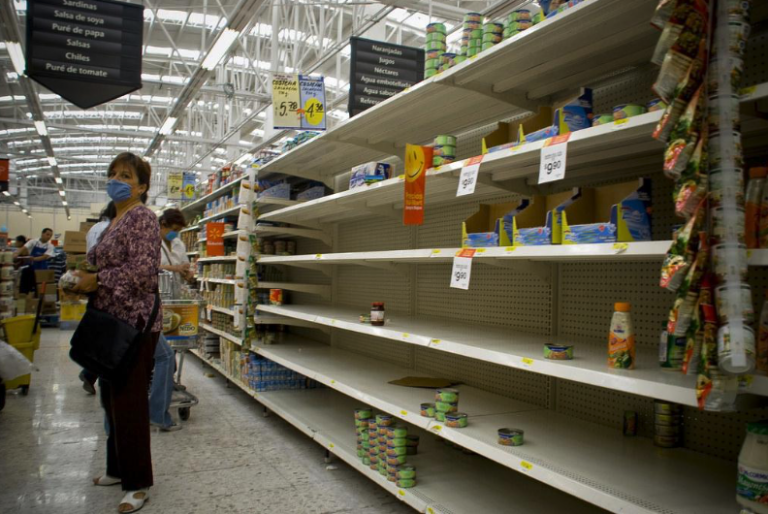 The results are the empty Venezuelan supermarket shelves. In the 1970s, the U.S. instituted price controls on gasoline. The result forced motorists to wait in long lines for hours to get whatever gasoline was available. Buyers at the end of the line frequently found that the gas was sold out once they reached the front of the line. Gas stations set limits on the amount of gasoline that could be purchased, forcing consumers to stand in line more frequently. When the government controls what is being produced and how much, an invariable hierarchy develops, as it has in Venezuela. While the average Venezuelan citizen goes hungry, government employees eat just fine. Not to mention the military and the police. President Maduro needs to keep these factions happy to ensure their support. So, they get the major share of available goods while the remaining population goes without. This sham is possible only when the government controls the means of production and distribution of goods. It would be impossible in a free society. In addition to shortages and hiking up prices beyond the means of the average Venezuelan, the country is experiencing extraordinary levels of hyperinflation. The cause of hyperinflation is always the uncontrolled, rapid printing of fiat currency. Venezuela’s annual inflation rate is 16,428%. According to Steve Hanke, a senior fellow at the Cato Institute, Venezuela’s inflation is exceeding 200 percent every month. It recalls the hyperinflation of post-WWI Germany when money was burned as heating material due to its low value. It was this hyperinflation that led to the election of one of the world’s darkest dictators – Hitler. In Venezuela, President Maduro is showing similar despotic tendencies. He is allowing a large part of the population to starve to maintain his socialist principles. Starvation and misery have become government policies. There is no other explanation. The situation can only worsen. As people die from hunger, the labor force is reduced, thus reducing the number of available goods, even more, creating even greater catastrophic shortages. All oil-producing nations have experienced falling oil prices. 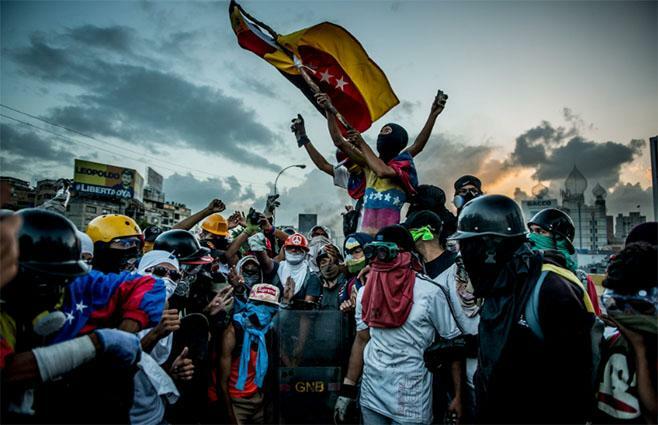 Only Venezuela is at the brink of an abyss from which it may never recover. 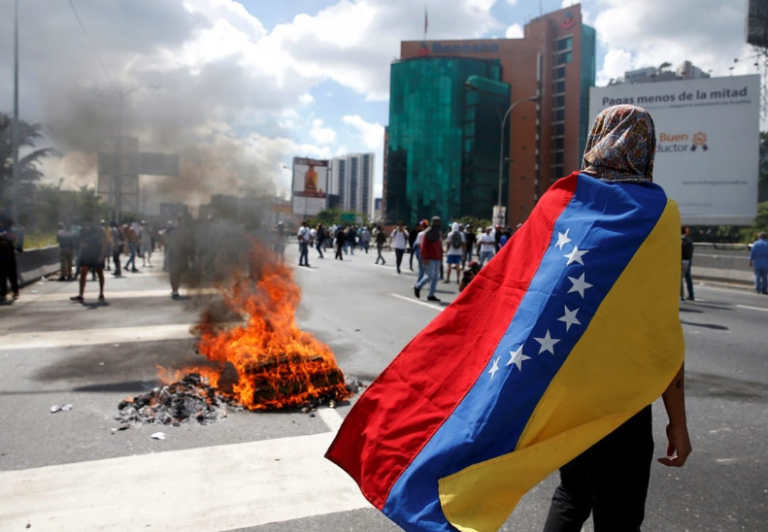 Venezuela is sinking in a quagmire of socialist principles. Inefficiency, corruption, price controls, and out-of-control hyperinflation have created economic madness. Does President Maduro care? It’s hard to say. But he and his military minions are not starving, and they have guns. The population is bound to notice sooner or later. What happens when socialism encounters the forces of reality? The world is watching this grim development, which undoubtedly will not have a happy ending.